(Howls for Holly Project) A candle bowl made in love gets passed back and forth when the need arises. Brook couldn�t believe it. Her first wolf-friend, Softjaw, was dead. They had bonded when she was a hand and one turn of the seasons, not long after the pup had first come out of its mother�s den. She hadn�t even gotten to really ride her. Brook looked at the lifeless body of her friend and cried. She wiped her tears away with a gloved hand. **Brook! ** her parents� sends called to her. The child acknowledged the send, but didn�t respond. She was too sad to say anything. Then, because it welled up both out of grief and instinct, she raised her head and howled. And then she was no longer alone. She felt her Chieftess� presence before she could see her out of the corner of her eye, and then heard her voice join in the howling. Then, coming through the trees before them, Brook heard her parents� voices, and watched as they joined the small, mournful group. Dreamberry wrapped a fur around her daughter, and Bearheart wrapped his arms around both of them. Easysinger knelt in the snow and examined the body of the pup and, not seeing outward signs of injury, pulled the lips back to examine its teeth. Brook and her parents watched as Easysinger pulled the wolf�s lips back. �Do you see?� she asked. Several teeth in the back were broken or missing, and one area of the gums had gone black. Brook had known her wolf friend�s bite was soft, but had never really examined her teeth or gums. �What caused that?� she asked. �Like rocks?� Brook asked, the reason for Softjaw�s bad teeth dawning on her. �Rocks would definitely cause teeth to break,� Dreamberry agreed, then added, �Broken teeth can rot and cause infection.� The other adults nodded. �Oh�� Brook responded sadly. She felt bad that her wolf-friend had died because of the gum infection. She wondered if Softjaw had also died hungry � it might have been hard to eat with her teeth that bad. Suddenly, Brook sneezed. Brook thought about it. �Yes, please,� she responded. �Easysinger!� Brook called out as her Chieftess entered the den. �Yes, thank you. Except... � her voice dropped off. �Except?� the eldest elder prompted. �I miss Softjaw,� she said quietly. Brook watched as Easysinger opened the leather cinch bag she had brought in with her. �What is it?� she asked. Brook reached out to take the bowl into her hands. She examined the carving of wolves running around the bowl. Brook let the fingers of one hand move slowly over the images of the wolves, and then she looked at the Chieftess. Brook nodded, her mind full of what her Chieftess had just shared with her. She gently set the bowl aside, then threw herself into Easysinger�s lap, giving her a hug. Easysinger was dead. Windburn was chief. Blacksnake had returned from killing the she-bear a few days before. He took a sip of the wine his brother had left him just a little while ago � after dressing him down for his grief-madness. One-Leg had been right. He had always looked down on those who would destroy themselves for what seemed like no reason. When Tyrlee died, though, her life stolen by an angry mother bear, Blacksnake finally understood. He had felt his own life drained away with hers, and the emptiness was unbearable. It was why he had gone after the beast. But he was still alive. And there was a tribe out there that needed him. He had missed being there when the chance to take up his Beloved�s torc had presented itself. It would have been easy to try and take it from his son, had he been there. But becoming Chief, at the time, hadn�t even been a consideration � how could it have been? Easysinger was gone. Blacksnake sighed, and took another sip of wine. What was the point? With the wine to warm him, he knew he could sit here on the Home Ridge in the freezing rain until he fell asleep, and let the cold gently take him. He turned where he sat to look down at Brook, who stared at him apprehensively with large, violet eyes. She wore a hooded cloak, shielding her from the rain, but the young elf still looked cold. �What are you doing here?� he asked, not fathoming why the child wanted to talk with him. Images of Brook visiting their den, laughing and talking with his lifemate came easily to him then, and inwardly he smiled at the sight of Tyrlee braiding Brook�s hair. They changed into similar images of the Chieftess with other children. She had always had a soft spot for the young members of the tribe and viewed each as precious. She had, on more than one occasion, told him to go easy on one or another cub. He could almost hear her now, offering that same advice, and telling him to hear her out. �I imagine we all do, Brook,� he said gruffly, setting the wine down beside him, and sliding off the rock he�d been perched on. Brook took a shy step back, then stopped herself. He watched as she took a breath and reached within her cloak to take hold of something from a sack. Holding it in her hands, she reached out with it, offering it to him. He realized he knew what she was handing him, and he took it reverently. Blacksnake nodded, clutching the bowl closely to his heart, trying to think of what to say. Then, Brook stepped forward and wrapped her arms around him. He didn�t hug her back, but didn�t push her away, either. In that moment, nothing needed to be said. He knew from Snowfall that Nightstorm had cried herself to sleep after sending their sister down the river the night before. The trio of sisters had been close in their own way, but he knew that Nightstorm was the most emotionally exuberant of the three, and that she was taking Whispersilk�s death particularly hard. In reality, they all were; the death of a tribemate was never an easy thing; the death of a family member even harder. He thought of his son, mourning the loss of his lifemate, and of his grandchildren in their loss of their mother. His own very personal experience with death when his lifemate died made him particularly sensitive to his son�s experience. He thanked the High Ones he had returned in time to reach his son. Though it would be hard, he felt that Windburn had made a turn for the better the day before � after a very emotional sending exchange. Windburn would move on. He would care for Cinder with the help of the tribe. And he would find ways to remember her. The thought of remembering brought to mind the bowl that Nightstorm had given him not long after Easysinger had died. He knew he still had it, so he headed to his den to retrieve it. Picking up the bowl, Blacksnake traced the images of the wolves, thinking about how life was still running its course, and of how birth and death and all that was in between continued forward, despite losses. An image of Easysinger came to mind and in it, she was smiling at him. He smiled to himself and, carrying the bowl with him, made his way toward Nightstorm�s den. The seamstress was just waking up. She startled when Blacksnake stepped in, and then sighed. �She�s gone, Blacksnake,� she said quietly, turning her back to him. 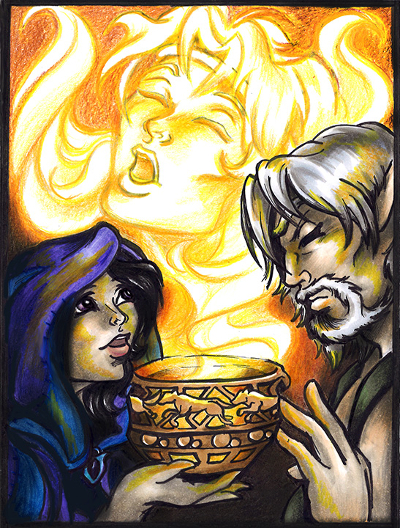 Nightstorm took the bowl that he was offering and held it close to her heart. �Thank you,� she whispered. In response Blacksnake reached out a hand and softly touched her cheek, remembering the time when she was little and so determined to help him in his own sorrow. Glad for the gesture and aware of its meaning, Nightstorm lightly leaned into his hand before he let go. He knew she would get over the pain same as he had managed back then. Now it was time to get back to Foxtail, Cinder, and Windburn. Maybe, he thought, he could make a memory bowl for them, too.